The resumption of Nigeria's domestic league has been postponed indefinitely amid a leadership crisis currently rocking the country's football. Chris Giwa, founder of a rival faction in the Nigerian Football Federation (NFF), armed with a court ruling from 2014, is now claiming to control the governing body. His assertion comes despite serving a ban imposed by football's world governing body Fifa, who recognise Amaju Pinnick as NFF president. Domestic football was due to resume on 18 July after taking a break while the World Cup took place. However the League Management Company (LMC) has postponed the resumption of Nigeria Professional Football League (NPFL) indefinitely. "The decision is based on the current adverse circumstances in the administration of football in the country as a result of which sponsors, partners and service providers have expressed strong concerns and are reviewing their involvement in the league," the LMC said in a statement. Officials have announced that "organizing matches of the NPFL under the current circumstances might cause irreversible damage to the League brand". The current saga, which has led to Fifa president Gianni Infantino warning Nigeria to respect the Fifa recognised board or face suspension, is a story four years in the making. Giwa has insisted since August 2014 that he was elected NFF president in a disputed vote that was not recognised by Fifa. 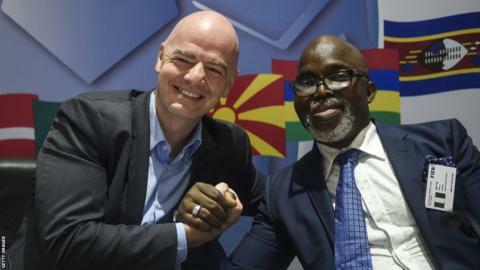 Fifa threatened to ban the country from international competition if Giwa did not step down, and at the end of September the NFF elected Amaju Pinnick as its new president. Yet Giwa has consistently put up a legal challenge against Pinnick, whose NFF board's tenure will expire at the end of September.